Bluefin Fitness 3D Vibration Platform Three-Dimensional Vibration and Oscillation fitness massage machine Lose weight, increase muscle mass and improve your fitness with the ultimate vibration Platform from Bluefin Fitness. 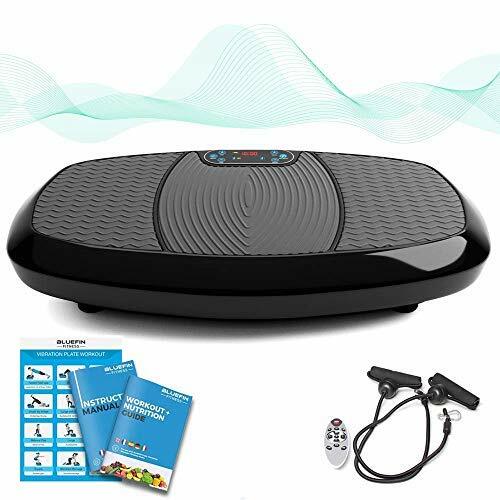 With 3D Vibration and Oscillation, the Bluefin 3D vibration Platform provides cutting edge weight loss technology for the home, improving blood circulation, reducing cellulite and increasing bone density at the same time. ✅ BATTLE FAT & BEAT THE BULGE WITH DOUBLE THE POWER FROM A DUAL MOTOR DESIGN - Intense 3D vibration can only be produced by 2 independant internal motors. Bluefin's silent drives work together to give you a COMPLETE workout. ✅ LOVE YOUR BODY & YOUR WORKOUT - Huge anti-slip surface for effective exercise you'll enjoy! Easily position yourself on the 3D and get ready for the deepest vibration fitness experience you've tried yet. ✅ 100% SATISFACTION OR YOUR MONEY BACK - Our brilliant customer service will help you get started with home fitness. Bluefin's unbeatable lifetime motor warranty has you covered for the long haul. ✅ FITNESS OPTIONS YOU'LL USE! - 3D spoils you with choice! You can choose from Vibration or oscillation independently or combine them for 3D motion! 180 levels + 5 Programmes will keep your muscles guessing and your workouts interesting. If you have any questions about this product by Bluefin Fitness, contact us by completing and submitting the form below. If you are looking for a specif part number, please include it with your message.